A prenuptial agreement – also known as a premarital agreement – is a contractual agreement that spouses enter into prior to marriage. Prenuptial agreements serve the purpose of predetermining the distribution of property in the event the marriage ends by divorce (or sometimes death). Additionally, prenuptial agreements can stipulate the amount of spousal support that a spouse may receive in the event of divorce. While traditionally reserved for the wealthy, the use of prenuptial agreements has become widely used among various income brackets and ages. The use of prenuptial agreements are particularly important in second and subsequent marriages. As spouses grow in age, family and wealth, the use of prenuptial agreements to secure property interests becomes increasingly important. There are particular instances when prenuptial agreements are of particular interest. 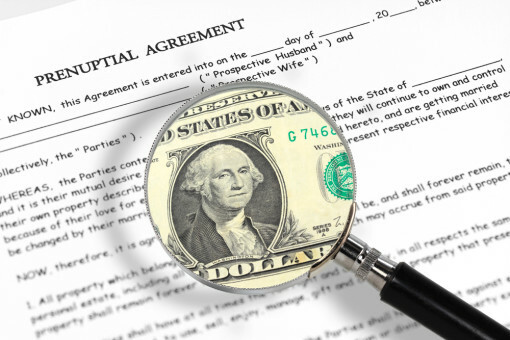 If a couple marries and they decide to live the house that was owned by one spouse before the marriage, a prenuptial agreement can specifically provide that the house will remain the purchasing spouse's separate property in the event of divorce. Without such an agreement, any monies paid into the mortgage by the non-purchasing spouse can be characterized as marital property and the non-purchasing spouse will be able to claim an interest in the home if and when they divorce. While couples enter into marriage with the goal of living a long and happy life together, circumstances –and people-change. Love and commitment does come and go far more frequently than would be anticipated. Premarital agreements can minimize surprise, suffering and financial loss. Prenuptial agreements should be created and read by an experienced Alabama family lawyer. If you are planning to get married you may consider a formal premarital agreement. This legal instrument can prevent future financial surprise and ruin. A prenuptial agreement can provide inner peace and surety in a world where love and marriage may not. Fortunately or unfortunately, these issues must be addressed in our fast moving, economically oriented society. The Yeatts Law Firm is ready to ask you the right questions and to help you proceed in your premarital agreement. For a complimentary phone consultation with a The Yeatts Law Firm, call (205) 530-1331. Call a Birmingham, AL Prenuptial Agreement Attorney Today!